This looks delicious. I don’t think I could say it any better, or would do it any differently! We cook some different dishes down here in south Louisiana. Boudin, jambalaya, gumbo – all distinctly Louisiana cuisine. One Louisiana culinary creation we serve at the Coffee House in The Cajun Village is a “Beignet Bourée”. This dish is essentially a combination of two Louisiana favorites: beignets and just about any Louisiana entree you can think of. 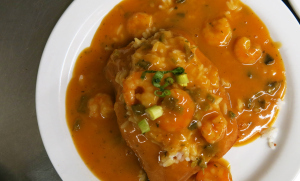 At the Coffee House, we like to serve Beignet Bourée with Shrimp Etouffee. Below are recipes for the beignets as well as the etouffee. All you have to do is stuff/top the beignet with rice and etouffee, and your Beignet Bourée is ready to serve!